There is a silver lining to Valentine's Day; everywhere you go, people are putting together little love packages that can also bring comfort to the single soul. When Brownie and I visited Roni-Sue's the other night, she had a little love package too, the Pig Out! Pig Out includes Brownie and Lawman's favorite, Pig Candy as well as two items Brownie cannot eat, the Bacon Buttercrunch and the BaCorn. When we went, I heard them offering the Pig Out (1/3 lb. Pig Candy, 1/3 lb. 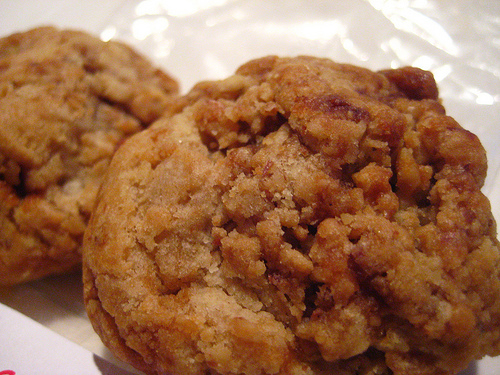 Bacon Buttercrunch, 1/4 lb. BaCorn), pondered getting it for a second, but then purchased all three items without going all the way to Pig Out. There is no method to my madness. While making my selections, I did ask "is this too much bacon?" only to be answered by a chorus of "No." Anyways, this was my first time eating both the Bacon Buttercrunch and the BaCorn, two of the newest additions to the Roni Sue menu. Of course, I love them both. For the Bacon Buttercrunch, Rhonda adds some delicious bacon to toffee, then covers it in chocolate and toasted chile pinon nuts. Crunchy, porky, nutty, chocolatey goodness! The sweetness overpowers the spice in the nuts, so you don't get a spicy treat. I fell in love with this so hard, I had to have two more immediately after my first one. The BaCorn is just as sinful: caramel popcorn with bacon and chile pinon nuts. It's out of control on so many levels. If they sold this at the movie theatres, I'd be a film buff. That's how good it is. While we were visiting, Rhonda allowed us to see their new space on the street side of the market. They're hoping to be fully moved over by early April, we'll keep you posted! God bless Rhonda Kave, we love her! Hanging out at the counter is one of my favorite things to do: Michelle's quips, Rhonda letting you eat all the chocolate samples, randomly throwing Jesus toast, there isn't a better way to spend an afternoon off. And now I have a new favorite thing, the Buttercrunch cookie. I will admit I do try to limit my Roni-Sue visits because I always want to take home Pig Candy, or BaCorn, or now Buttercrunch cookies. They're chewy, buttery, nutty sweet goodness, and just as good the next day (I did have the So Good at Shopsin's-the line has to be drawn somewhere!) They're offering at least one other type of cookie, Chocolate Chocolate, and I suspect many more are in the works. Apparently this is what I've been missing, and now that Ginger is converted, I doubt I'll be away for long.